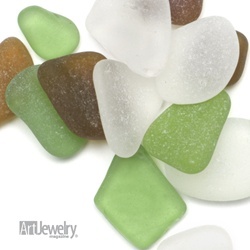 Sea glass always has appealed to me for jewelry designs. I’ve drilled it and wire wrapped it and used it in mosaics. I’ve also made it. Me and a rock tumbler. 8-12 hours with some medium grit and voila, sea glass…or should I say “sea glass”. Now you can wander the beaches of the world collecting sea glass or you can buy “sea glass” or make your own. Most people end up buying it. So how can you tell if it’s real. Unless you actually pick it up off the beach you don’t know. Well Art Jewelry magazine online wants to tell you how to tell the real from the fake. Sometimes you need to know…they’ll help you.